Yes, You CAN Get Out there and GO! It is said that to “take a solo trip” should be on every woman’s Bucket List. As a mother of three active teens, a supportive wife, caretaker of one needy Labrador, and manager of everything that makes my family of five function; doing anything solo sounds enticing! Now, I won’t lie and tell you that I didn’t experience moments of doubt. For example, when I saw on the in-flight TV screen the daunting distance over the Pacific Ocean that the aircraft was taking me. And, during the turbulence, (inevitable when you fly that long and far), I prayed that my children would survive a week without me, get to school and dance lessons on time, eat a few healthy meals, and that someone would remember to re-fill the dog’s water dish! When we finally landed in Melbourne, the capital of Victoria, I felt exhilarated -- baggage for one, taxi for one, hotel room for one. So very quick and easy! After settling into my hotel room with a fab view of the Yarra River, I drank a strong cup of coffee, grabbed my camera and backpack, laced my comfy Adidas, and headed out to explore what has been crowned one of the world’s “Most Livable Cities.” A fact touted by more than a few proud locals! I am a planner and enjoy researching my destinations, so I felt somewhat familiar with Melbourne prior to my arrival. While I like being proactive and having an itinerary, being flexible is also essential. I had my list of “Must See” sights in what has been called a "soulful" city, and was eager to experience its diverse culture, get a taste of the lively cafe scene (not just good coffee, but exceptional coffee), take in its European inspired architecture, and indulge in the sophisticated cuisine. But I also made time to wander. A gift unimaginable in my over-scheduled life back home. Each day I planned a destination, but always made time for spontaneity. I browsed pretty boutiques, sipped green tea matcha in hip cafes, meandered and photographed the city’s lanes and alleys famous for their vibrant street art. I people-watched from the steps of museums and got lost in the lush flora and fauna of the Royal Botanical Gardens. I attempted to capture “artsy” shots of the city’s pairings of contemporary and traditional architecture. The sprawling Queen Victoria Market, or “Vic Market,” where street musicians played festive Spanish tunes, was the happening spot on Sunday. I purchased and ate savory almonds and sweet dried apricots from Middle Eastern vendors. I wandered into a tiny shop called “Books for Cooks,” my eyes devouring its recipe of colorful books, polished copper pots, and shiny chef's tools decorating every nook and cranny of this cozy find. Such discoveries were hidden gems not always in guide books. I took the advice of a travel magazine editor who encouraged his readers to “dig into the culture…” and so I did. Part of “digging in” is to talk to the locals. To put yourself out there. This opportunity presented itself in more ways than I could have imagined in this multicultural city. There was the chatty shopgirl from Rome who found me the perfect pencil skirt; the sweet barista from Uruguay who nearly fainted when I told him I had visited his hometown of Punta del Este; and the cab driver from Pakistan who immigrated to obtain a better education. When I asked the hotel concierge for dinner reservations at hip bistros on my list; he kindly reserved a seat at the bars in these eateries so I could easily talk to those sitting next to me. There was the charming couple from Sydney grabbing a bite before the theater; a lively group of 20-somethings enjoying a girl’s night out who were curious about California. The servers and sommeliers were friendly and welcoming, willingly answering my questions about their vibrant city, and wishing me to relax and enjoy myself. Not once while I was dining out did I feel awkward or lonely. At the end of the week, I attended the Travel Bootcamp thetravelbootcamp.com where I met many people from around the world including Lily, from Texas. We hit it off, and on my last day in Melbourne, we took an all-day, guided tour of the Great Ocean Road one of the world's most scenic coastal drives. We laughed until we cried when we got soaked in a downpour trying to take photos of the iconic 12 Apostles rock formations. Neither the rain nor whipping wind could stop Lily from filming her “Instagram Stories.” We still keep in touch, and if I ever travel to Austin, Lily will definitely be my tour guide! 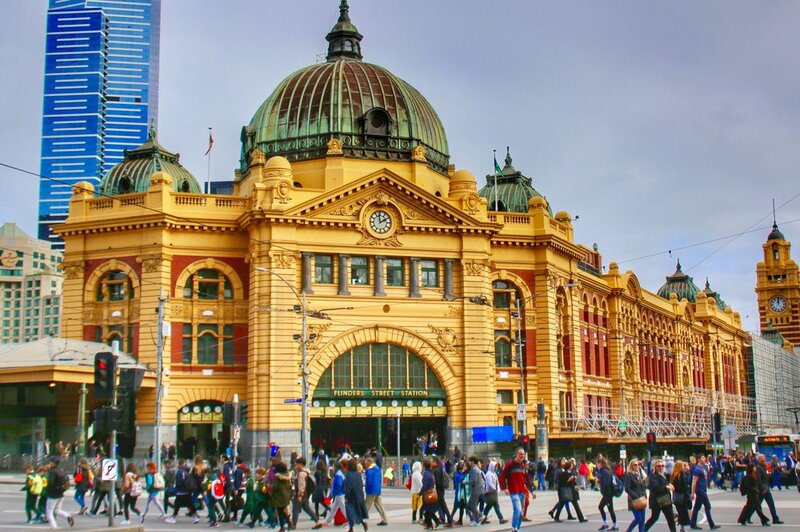 Melbourne was ranked as one of the top cities for solo women travelers by Travel & Leisure, a fact I found comforting. However, I behaved there as I would in any big city. I walked confidently. I took cabs after dinner if it was dark. I was aware of my surroundings, and used common sense. I found that when traveling solo, my senses worked overtime. I appreciated the lively chatter in restaurants, the aromas in cafes, the colors of city life circling around me. I catalogued details to share later with my husband. Little things he would enjoy, like the delicious white wine from Western Australia that tasted like Summer. Or the savory staple of focaccia dusted with sea salt and herbs that my son would devour if he were sitting next to me. And the pastel macaron tower commanding center stage at the Royal Arcade bakery; a patisserie beauty my daughters would have begged me to buy. Thinking of the anecdotes and stories I would tell them when I returned, somehow made me not miss them as much. And, I promised myself that one day, I would bring them to Melbourne to see it all for themselves.